수국사는 세조의 큰 아들인 의경세자(懿敬世子)가 20세의 나이로 요절하자 '덕종'으로 추존하고 넋을 위로하고자 1459년(세조 5) 그의 묘(후에 경릉敬陵으로 추존) 근처에 지은 왕실 원찰(願刹)이다. 창건 당시 명칭은 정인사(正因寺)였으나, 1471년(성종 2) 소혜왕후가 중창한 이후 수국사(守國寺)로 개명하였으며, 조선시대 동안 서오릉(西五陵: 창릉·경릉·명릉·익릉·홍릉)을 관리하고 왕실을 안녕과 무병장수를 기원하는 사찰로서 기능하였다. 수국사 목조아미타여래좌상은 제작연대가 적힌 발원문이 없어 정확한 조성 시기는 알 수 없지만, 중후한 얼굴과 건장한 형태미 그리고 이중으로 입은 착의법과 자연스러우면서 특징 있는 옷주름 등에서 13세기에서 14세기 전반기에 조성된 불상들과 양식적 특징이 유사하다. 즉, 힘과 중후함이 느껴지는 얼굴과 신체는 물론 왼쪽 어깨에서 짧고 촘촘하게 흘러내린 주림이 좁은 겹 오메가(Ω)형의 주름을 형성하고 있는 점과 금구 장식 없이 간결하게 처리된 승각기의 표현 등은 서산 개심사 아미타여래좌상(1280년 중수), 서울 개운사 아미타여래좌상(1274년경), 나주 심향사 건칠아미타여래좌상(보물 제1544호) 등 13세기 중·후반 경의 불상들과 비교된다. 특히 이 불상에서 느껴지는 중량감 넘치는 건장한 남성적인 형태미는 고려후기 귀족풍의 단정하고 아담한 형태미를 추구했던 하나의 조류와는 또 다른 불교조각의 흐름과 미의식을 알려 주고 있어 그 의미가 크다. When Crown Prince Uigyeong (1438-1457), the eldest son of King Sejo, died prematurely at age 20, he was posthumously honored as King Deokjong and a Buddhist temple named Jeonginsa was built in 1459 near the prince’s grave to pray for his soul. The temple was rebuilt later at the present location and renamed Suguksa, meaning the “Temple of Protecting the Country,” to serve as a tutelary temple for the royal family. As there is no inscription or invocation, it is not known exactly when the Amitabha image was created. 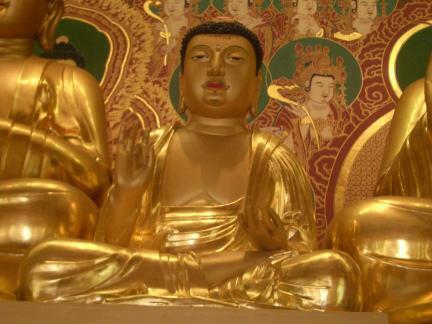 But the Buddha’s dignified face and robust body and the double robes with unique and natural folds show stylistic resemblance to Buddhist images produced in the 13th to the early 14th centuries. In particular, the noble and masculine face, the narrow folds in the robe flowing down along the sides of the shoulders, and the simple and unadorned inner garment are all reminiscent of several other images dated mid- to late 13th century, including the Seated Amitabha of Gaesimsa Temple in Seosan, which was repaired in 1280; another Seated Amitabha at Gaeunsa Temple in Seoul, dated around 1274; and Dry-lacquered Seated Amitabha of Simhyangsa Temple in Naju, designated Treasure No. 1544. Notably, this icon’s dignified masculinity stands for a new aesthetic tendency which differs from the graceful elegance characterizing most Buddhist sculptures of the late Goryeo Dynasty.